May 5, 2015 July 10, 2016 Nancy L.
Improve balance and coordination; reduce the risk of injury through proprioception training. Proprioception is your sense of position. It is knowing where your body is in space without having to look, a subconscious process. For example, it enables you to walk without looking at your feet. One’s proprioception tends to weaken with age. This is because signals to and from the brain slow with time, resulting in a negative effect on balance which increases the risk of falling. Impaired balance is usually one of the first symptoms of declining proprioception. There are, however, exercises designed to improve one’s proprioception, performed at any age. When properly executed these exercises teach/re-teach the brain/body to adequately and safely react to changes in position, surroundings and other external forces. 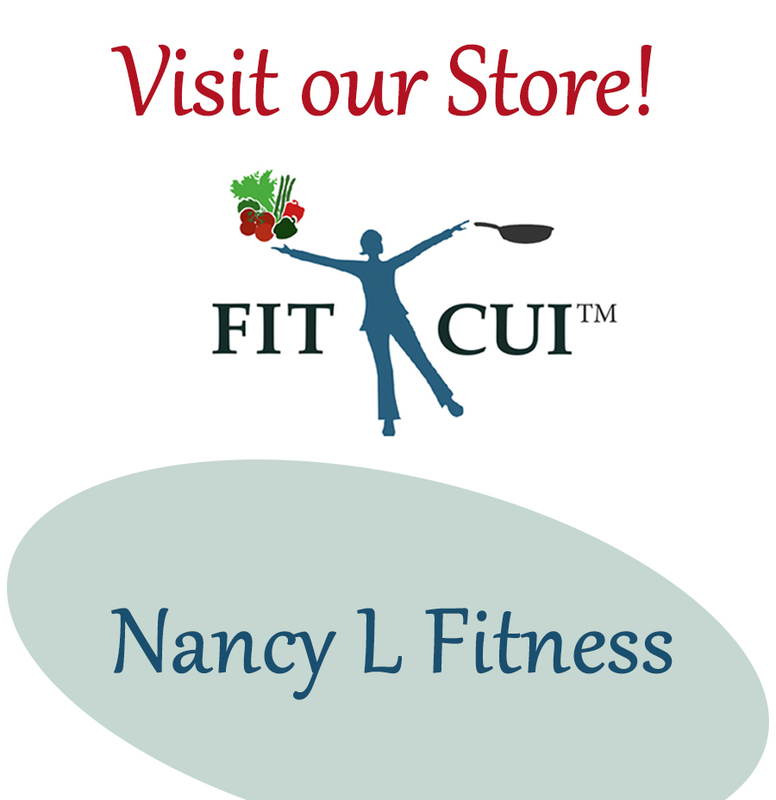 Contact a health care professional with any questions before beginning any training/exercising. Be careful about participating in group fitness classes such as advanced core training that require a higher level of expertise. Start with simple exercises on the floor; increase the difficulty as proprioception improves. Wear non-restrictive clothing and good shoes. Be near a support (such as a wall or a chair) or have someone in the room in case of dizziness or weakness to catch yourself if you lose your balance. Concentrate on breathing; do not hold your breath (may adversely affect blood pressure). Without looking down, slide left foot back until a slight stretch is felt. Hold this position for 7 seconds. Looking straight ahead, stand on left leg. Maintain good posture. Maintain this position for 3-5 sec. Hold longer to increase difficulty. 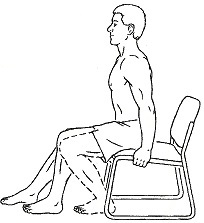 Standing on left leg, raise right leg so that thigh is parallel to floor. Slowly turn head side to side. Then, rotate head up & down. Hold each head position 3-5 sec. Stand on left leg (if needed, hold onto support-counter top). Looking straight ahead, bend and raise right knee. Move bent leg out to the side, slowly bring it back-keep it bent. Hold position for 5-7 seconds. 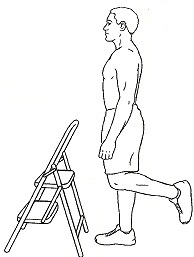 Look straight ahead; stand on left leg. Back straight; shoulders rolled back. 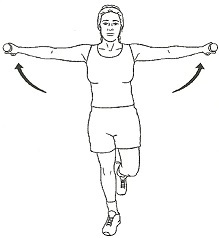 Bend elbows at sides, slowly bring dumbbells up; do not arch back. Repeat standing on right leg-10 reps.
Arms/hands at sides with dumbbells. Slowly lower dumbbells to start position. Do 10 reps.